OK, first off, if they're going to have this mock press conference, why is Phillips speaking in the bland cadence of GMs? More accurately ... why isn't he saying anything? Is this supposed to be analysis? Why is he just spouting press releases? Oh, and, honestly, why does ESPN have real reporters asking questions? Poor Buster Olney, the guy's got a huge cover story about steroids this week, he's written for the New York Times, and now he's got to ask these fake questions with a fake notebook? Are we supposed to think he's actually writing anything on that? And why are they wasting five minutes of SportsCenter during one of the most busy times of the year with this? Are they really going to do every team? And why do they keep acting like there's this onrush of questions? They're gonna call on Olney or Schaap every time; isn't it just mean to make the interns keep shouting things out? Are those really flashbulbs going off? Where is this filmed, anyway? Shouldn't some of those reporters be out, you know, reporting? Oh, and why does Phillips keep answering questions like he really has a relationship with the people he's talking about? "I — along with the Tribune company — am committed to Dusty (Baker) and I like what he's doing with this." What? We have fake owners now? Can we have a fake firing? Please? Are we going insane? Oh, and the best part: When Phillips called on Jeremy Schaap to ask a question today, he totally called him "Jerry." 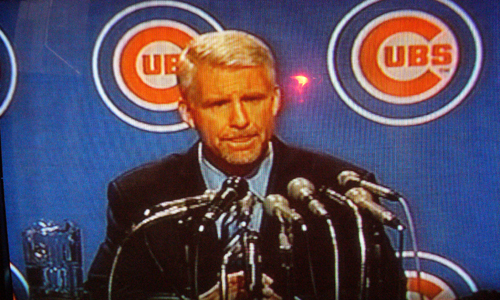 Of course, it's possible that just like Phillips is playing the "character" of Cubs GM, maybe Schaap is playing the character of "Jerry the reporter."